There is often a difference – sometimes large as in last Saturday’s gilets jaunes protests - between protestor numbers given by the authorities and those given by the organisers due to the fact they do not use the same methods to count people. 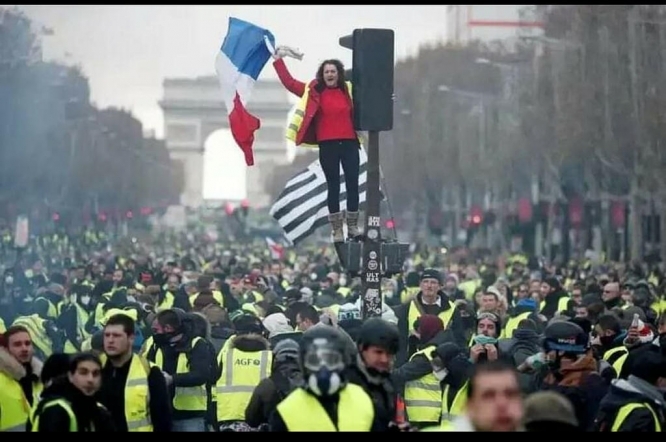 On Saturday, for example, the police said there were 84,000 gilets jaunes protestors whereas the gilets jaunes said they were 147,365 all across France. This difference is due to the different methods organisers use to count. They often have a first idea of how many people will come due to the number of train seats or coaches they have to book, or via the organised facebook events in the case of the gilets jaunes. Then, on the day of the protest, there are two people who stay at different locations and count the rows of people. In Paris, they generally estimate that there are 20 to 25 people in one row. However, sometimes organisers use other methods: they divide the whole surface area of the protest by one to have an idea of how many people are there, claiming that a protestor has one square metre for himself. Sometimes, organisers also approximately count when they see the size of the crowd. They often claim that they know how many people are in the crowd thanks to experience. The police method is different. Two officers count the rows of demonstrators. One stays at the beginning of the demonstration and the other one in the middle of the route of the demonstration. Then they multiply the numbers of rows by the average number of people in one row, and add 5% to 10% of people as an error margin. Since 2009, they also have to use videos of the protest released after the event to check their estimation was correct. It often happens that the first number they found was bigger than the second one. In 2015, a study directed by former member of the Conseil Constitutionnel Dominique Schnapper, INSEE inspector Pierre Muller, and politics lecturer Daniel Gaxie has shown that the method of the police was the correct one to count the number of people in a crowd. They also suggested to give an indicative range rather than an exact number.